Choosing the right hiking boots doesn’t have to be difficult if you are armed with the right information. Both men’s and women’s ALTAI™ hiking boots are designed to perform beautifully under harsh conditions. They are engineered out of the same materials as the military and police tactical boots. You can expect comfort and support with the ankle-high design of lightweight and waterproof hiking boot. Quality materials provide excellent protection for your feet. The superfabric® boot upper is uniquely breathable and waterproof. The hiking boots that you choose should match your hiking style. Are you looking for comfort for hiking on a well-groomed trail or do you love the adventure of a more challenging backpacking excursion? 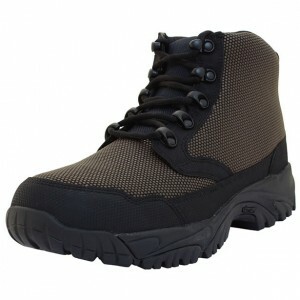 Then you want to choose a boot that is very durable, and protective. The smartly designed ALTAI hiking boot can handle rough terrain and protect your feet from injury. ALTAI hiking boots provide an outstanding outdoor experience. They are engineered to be a high performance hiking boot that lasts. Our design engineers incorporated the same materials as the military and police tactical boots. The hiking boot application utilizes waterproof, breathable materials in an ankle-high design. ALTAI boots are constructed from a series of lightweight breathable synthetic materials for superior comfort and durability. These materials are 100% waterproof providing exceptional resistance to stains, liquids and abrasion. The 6″ military boot upper extends beyond the ankle for maximum support and protection from the elements, even in extreme weather conditions. The Boot Outsole is made by VIBRAM with wide lugs, which makes highly durable and lightweight non-marking rubber soles that are completely resistant to oil and other industrial substances for excellent performance, stability and traction, even in extremely wet conditions or completely submerged in water. The field-tested anti-clogging tread pattern is designed to reduce the amount of mud, dirt and other debris from building up on the outsole. Perfect for most outdoor uses. According to the ALTAI website, the MFH100-S is NTOA (National Tactical Officers Association) member tested and approved making them a perfect alternative for any branch of the military, including the Army, Navy, Air Force, Coast Guard or the Marine Corps. I was quite impressed with the way that the MFM100-S boots fit my feet, and I expected the MFH100-S to fit my feet equally well. Like the other pair of boots, they did have plenty of width and toe room inside, but they felt a little too rigid initially. However, based on my prior experience, I knew that I could easily break them in with a few short walks. Typically I wear a 10.5 in most boots so based on ALTAI’s recommended sizing, for this test I chose a size 10. Like the MFM100-S, the MFH100-S boots fit perfectly right out of the box with thick wool socks. However, I decided to insert a thin foam insole below the factory insole just like I did with the previous pair, and then it fit my foot perfectly without having to wear thick socks. After breaking them in with a few long walks close to home, the boots remained supportive, flexible and very comfortable. I have since been wearing the boots on and off for quite a few months now, and between the long rugged trails and miles of concrete and asphalt pavement, I have put a lot of miles on them. Yet, the VIBRAM outsoles have shown very little sign of wear which is actually rather surprising because I am usually pretty hard on them. To test out the waterproof capabilities of this boot, I performed the exact same test that I performed with the MFM100-S. 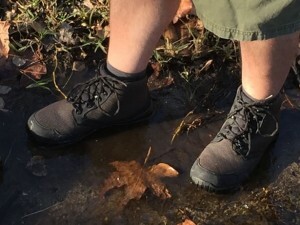 I stepped down into a stream of until the toebox of the boot was completely submerged, but well enough below the tongue stay to keep the water from going over the top. I never felt any moisture reach my foot so the SuperFabric did exactly what it was supposed to do, keeping my feet warm and dry. ALTAI’s boots are built for comfort from quality durable materials to be lightweight, waterproof and abrasion resistant from the ground up so they perform well in some of the harshest of environments. From construction sites to the outdoors in wet weather, they excel in wet conditions keeping your toes warm and your feet dry, and they clean up in a snap. However, without a Gor-Tex liner you will likely need a pair or two of thick wool socks to function comfortably in extremely cold weather. Aside from the dark color of the upper, midsole and outsole, the MFM100 and MFH100 appears to be the same boot as far as I can tell. Although, I feel the dark color has more of a dressed-up look to it. But the MFH100-S is just as affordable, and perfect for the military, law enforcement, contractors and survivalists on a budget. Another two thumbs up.